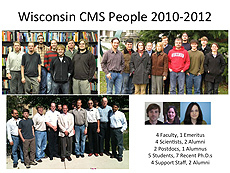 The University of Wisconsin experimental particle physics group focuses on searches for the Higgs boson within and beyond the Standard Model. The group also focuses on new exotic particles, forces and symmetries while backing them up with detailed measurements of the Standard Model parameters. Close collaboration between the phenomenology and string theory groups is the strength of the theoretical program. WHAT SETS PARTICLE PHYSICS AT THE UNIVERSITY OF WISCONSIN APART? Wisconsin has a broad program covering all aspects of particle physics: detector building, trigger electronics, software and computing, physics analysis, phenomenology and formal theory.